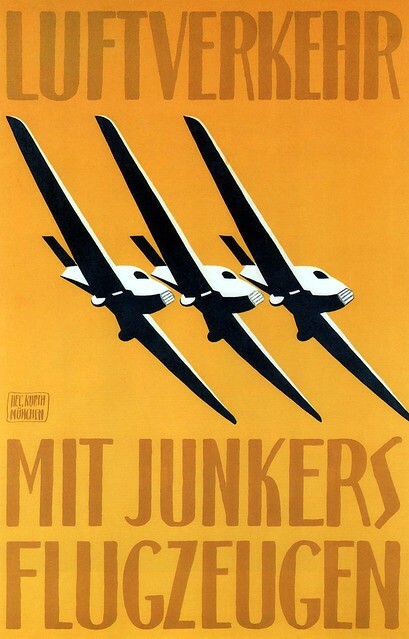 Via the excellent Dieselpunk, an great 1919 poster from Germany, advertising civilian air travel with Junkers aircraft. “Air Transport With Junkers Aircraft”, 1919. Click to see larger over on Flickr. This would have been part of the effort by the German aviation industry to “civilianize” as rapidly as they could, to try to salvage something from the post-Great War wreckage, and the restrictions the Allies were imposing on military aviation in Germany. It’s also a fantastic poster, in a style I really, really like and occasionally attempt to emulate.